Saddle up with this western classic, ya'll! 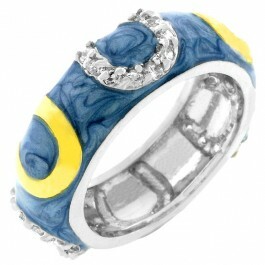 Stunning 14K Gold bonded and CZ horseshoes make up this western shiny light Blue enamel silver tone eternity ring. White Gold Rhodium Bond is achieved using an electroplating process that coats the item with heavy layers of rhodium, a close cousin of platinum that costs three times as much, which gives our jewelry a platinum luster. 14k Bonded Gold is achieved using an electroplating process that coats the item with heavy layers of 18k Yellow Gold and color-treated to a perfect 14k Hamilton gold color.